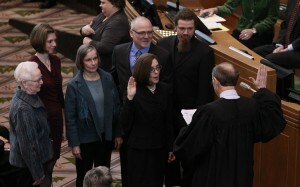 SALEM, Ore. — Kate Brown was sworn in Wednesday as Oregon’s governor following an influence-peddling scandal that prompted the resignation of fellow Democrat John Kitzhaber, who had been the state’s longest-serving chief executive before his swift fall from grace. Brown assumed Oregon’s highest office during a ceremony at the state Capitol. Brown, formerly the secretary of state, becomes the first openly bisexual governor in the nation. “There is a great deal of work ahead of us, and I’m ready to roll up my sleeves and get to it,” she said. “We are all keenly aware of the difficult circumstances that brought us to this moment — circumstances that none of us would have predicted only a short time ago,” the new governor said. Brown, a 54-year-old Minnesota native, came to Oregon to attend law school in Portland, the state’s largest city, and established a family law practice before her first run for the Legislature. Kitzhaber handily won re-election in November to a fourth term after surviving the botched rollout of Oregon’s online health care exchange, which turned into a national embarrassment. But the allegations surrounding Hayes’ work were more harmful, dominating headlines in the state following his victory. A series of newspaper reports since October have chronicled Hayes’ work for organizations with an interest in Oregon public policy. At the same time she was paid by advocacy groups, she played an active role in Kitzhaber’s administration, a potential conflict of interest. Kitzhaber, 67, met the 47-year-old Hayes before the 2002 election, when he was governor and she was a candidate for the state Legislature. She lost her race, but they reconnected after Kitzhaber’s term ended.